So it had to happen sooner or later, and it happened this weekend. I had to go grocery shopping. Our stock pile is starting to get really low since we have been living off of it for three weeks. It has really been nice to not feel pressured to shop since I have been so busy with school. Even without shopping my family was still able to have well balanced meals. This was NOT a great week for deals at the grocery store, but I still did pretty good with finding a few good deals today. My schedule has been jammed packed for the past two weeks I have NOT had time to grocery shop. My shopping trips have consisted of just running in and grabbing milk, eggs, fresh fruit and fresh vegetables. It is a good thing that I have a stockpile of commonly used groceries in my home. Without a stockpile I would not have been able to skip the actual shopping for two weeks in a row. Of course, I probably have missed some really good deals because I have not shopped. However, missing a few good deals does not trump the time I have saved myself this week by living off of our stock pile. The great thing about coupon shopping is the ability to purchase items at a cheaper price. 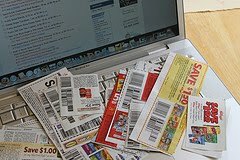 The even greater thing about coupons is saving them for use until the item is on sale so that you drive the purchase price down even lower. I buy most items only when they are on sale and I have a coupon to further reduce the price. Some people ask, ”why buy it if I don’t need it?” You buy it when you can get it almost free and save it or stockpile it for when you need it. It takes about six to nine weeks to get a good stockpile of almost free groceries. Most grocery items have a long shelf life so you really do not have to be concerned with your purchases spoiling. You never know when you will be unable to shop due to unforeseen circumstances, so it is a wise idea to have generous stockpile stored in your home. During the past 6 months or so we have lived off of our stockpile several times due to illness and our busy schedules. We have also been able to donate to others in need just by grabbing things off of our storeroom shelves to give as donations. I love my stockpile. I don’t know if I will have time for a formal shopping trip this week, but if I don’t it will be alright because I still have plenty in the storeroom.